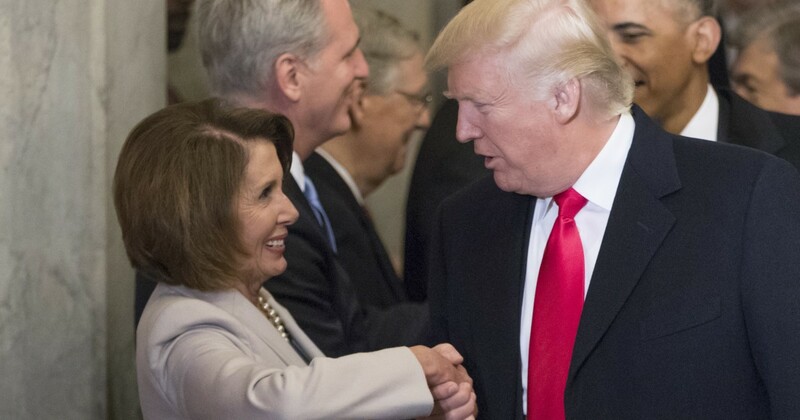 President Donald Trump responded to House Speaker Nancy Pelosi on Thursday with a letter of his own, announcing he was canceling her trip to Belgium, Egypt and Afghanistan in apparent retaliation for Pelosi asking Trump to delay the State of the Union until after the government shutdown ends. A Pelosi spokesman did not immediately respond to a request for comment and it was unclear what travel plans, if any, she had. At the Pentagon Thursday morning, Trump continued to push for border security, including his proposed border wall, accusing Pelosi of refusing to let Democrats negotiate. Last year, Trump delivered the State of the Union to a televised audience of 45.6 million people, leaving the impression that Pelosi is denying the president a prime platform to share his point of view as leverage against the president. Pelosi said she is confident security professionals could keep the event safe, but added her qualm is that they would not be immediately paid for their work. “This is directly related to our security,” Pelosi said, recounting several votes the House has taken to end the shutdown. Pelosi predicted there’s “bipartisan agreement” to use other technology to protect the border, but stressed “I’m not for a wall,” when she was asked why she hasn’t proposed an alternative dollar figure to counter the president’s $5.7 billion demand for a barrier.